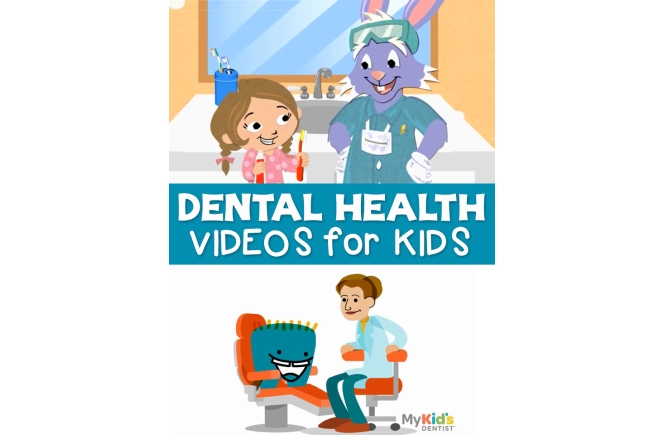 KidsHealth.org is an amazing human body resource for young learners. The site has videos, articles, and activities about the body. This muscular system video is one of their many videos. It’s a great intro to muscles and how they work. This video is animated, but goes more in-depth about how muscles work. It explains the difference between voluntary and involuntary muscles, as well as the three types of muscles. I’m a HUGE fan of SciShow for Kids. Their videos are outstanding! This video describes how the muscles, bones, and nervous system all work together to help us move. StoryBots are another favorite of mine. Their catchy songs teach quality content without kids even realizing it. Students will love this song about the bones. “The foot bone’s connected to leg bone”…This fun song has been around for a long time and kids today will still enjoy it! SciShow for Kids packs a lot of interesting facts about bones and the skeleton in this short four-minute video. This StoryBots’ song about the brain is great way to learn basic nervous system facts. KidsHealth.org shares about the different parts of the brain and their functions in this video. This video explains how challenges help our brain grow. (Growth mindset, anyone?!) After watching the video, give your students’ brains a workout by having them complete several challenges like write with the opposite hand, say the alphabet backwards, or draw an object with their eyes closed. Another StoryBots’s song that will help students learn a basic understanding of the heart and circulatory system. This SciShow for Kids video about the heart is a great introduction or review of how the heart works and how blood circulates through the body. At a little over six minutes, this KidsHealth.org video gives an overview of the circulatory system and goes into greater detail about the heart. It talks about the exact path of blood through the heart, as well as provides information about the different chambers and valves in the heart. This video is neat because it is told from the point of view of an animated drop of blood. The blood droplet explains what happens as it travels through the circulatory system. Another fun Storybots’ song about the human body. It explains basic respiration, as well as how we use our lungs for things like playing an instrument. KidsHealth.org provides another great video about how our lungs work. Mr. R.’s Songs for Teaching has some really fun songs for students. This respiratory system song provides lots of repetition and rhyme to help students remember the concepts. The lyrics appear on the screen throughout the video. This video is almost three minutes long and might be better for third grade and above. I love that the Storybots’ song about the digestive system is titled “Food Into Energy”. It helps students’ understand the main reason we need food- for energy! KidsHealth.org gives a fun, animated look at digestion as the characters take a trip through the digestive system. This Mr. R.’s Songs for Teaching is so cute and kids will love it! Lots of repetition and funny words will have students singing this catchy digestion song in no time. KidsHealth.org provides a perfect explanation of how the urinary system works. Make Me Genius gives another overview of the urinary system that young students will understand. This five-minute video provides a brief introduction to all the major body systems. These videos are just a small portion of the videos I’ve collected. When we studied the human body, I spent HOURS searching YouTube for the best human body videos for kids. I’ve watched all of them to make sure they’re great quality and appropriate for young students. I suggest you preview the videos before you show them to make sure they’re a good fit for your students. 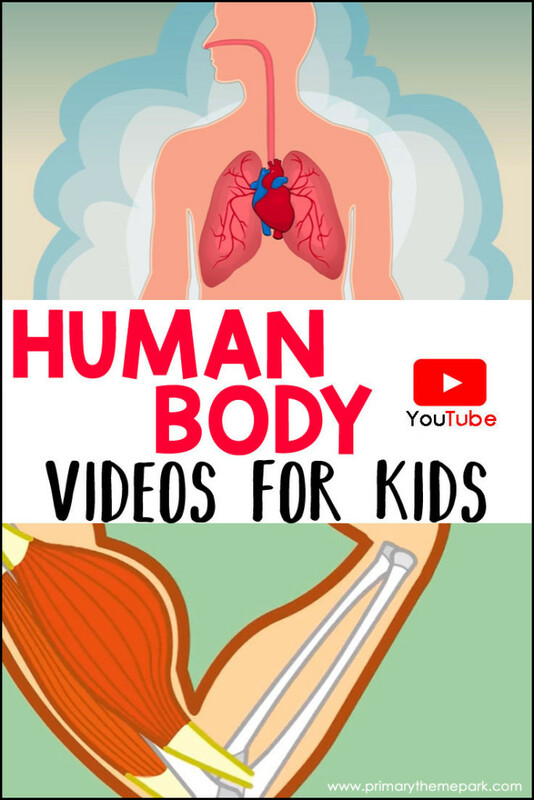 You can find over 50 human body videos for kids on my playlist below. The videos are grouped together by body systems. 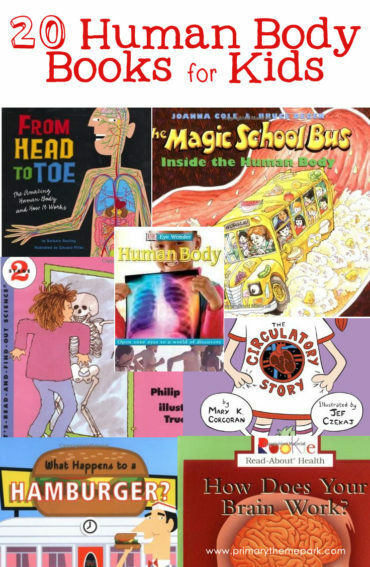 The videos are perfect for introducing body systems, using as a review, for early finishers, or as a center activity. I hope these videos are a meaningful addition to your unit! Thank you so much for your research and sharing! I teach TK and the kids are so interested in learning more about their bodies! Thank you so much for sharing these wonderful videos. Be very blessed!!! I love your videos. They suit the levels of my school which is an independently owned and run almost for 25 years as an early childhood care and education. In 2000 when Papua New Guinea made its educational reforms, we also got registered as a permitted school. My apologies, I have just now read what you said and now understand what to do with them. Thank you for your research and help already given here. I will use those directions. May even have to order these additional texts. Thank you! I hope your students enjoy watching the videos and it helps them better understand the human body. Great list – thanks for sharing! We’re fans of Kids Learning Tube that has a playlist of ~25 human body songs -https://m.youtube.com/playlist?list=PLmIHwWY0hiuz6ckjjBR4U2Hkkbh5x5Eer. 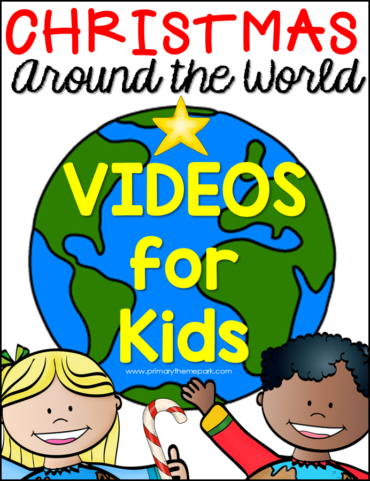 Thankyou .Loved all the videos that you have shared .Its a great resource that I intend to share it with my class. thank you so much… what a wonderful job .! Wonderful videos, thanks for sharing. I really liked it.